This is a feature that allows players to Search for Items for sale in towns that they are currently in. This makes it much easier to find all the vendors in the area that sell a specific Item that a player is looking for. It is important to keep in mind that the search bar is caps lock sensitive, therefore players need to use the exact lowercase and uppercase letters to find what they are looking for. The feature appears on the player's interface in the symbol of a magnifying glass. 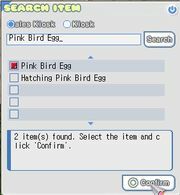 If multiple Items share a similar name then players will be presented with a list of Items and need to select the one that they are searching for.